“Four years ago, I wrote a blog post with a catchy title: “The Death of the Buck-A-Mile Backhaul,” where I explained that carriers could no longer cover costs on $1.00 per mile. At the time, those cheap hauls were going away. “In March 2012, there was only one major van lane paying $1.00 per mile: Philadelphia to Chicago, at 48¢ for the line haul, plus a fuel surcharge of 52¢. Of course, truckers were spending more than $4.00 per gallon for diesel in 2012, and a lot of other costs had also risen well above historical levels. “Fuel costs are way down now — and so is the surcharge, at 14¢ for vans last week — but other costs have gone up. 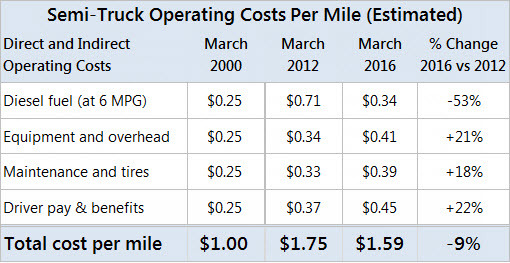 Total operational costs couldn’t be covered at $1.00 a mile in 2012, and they can’t be covered now. “Yet, I regret to say, the “buck-a-mile” backhaul has returned to U.S. highways. Sure, those low-priced backhauls are paired with higher-paying head hauls, but not all roundtrips average to a profitable rate per mile. Fuelcosts averaged $2.02 per gallon in the U.S. last week. Depending where you filled your tank, your costs will vary. Divide your cost per gallon by your mileage — let’s call it an even six miles per gallon — and you get fuel cost per mile of about 34¢. Compare that with March 2012, when fuel was averaging $4.14 per gallon, or March 2000, when it cost $1.49. Big differences there. Equipmentlease costs have changed, too. A tractor and trailer might cost more than $130,000 now, or you might get a good deal on used equipment. On the upside, interest rates are at historic lows, but you might have more overhead now than you did in 2012. Maybe you have additional equipment that is sitting idle, or you have to pay to park your rig. I estimated that costs rose 21% for leases and overhead in the past four years. Maintenance and tirecosts vary, depending on make and age of equipment. It seems clear that these costs have gone up since 2012, so I’ll add 6¢ to my previous estimate, for a total of 39¢ per mile. You can substitute your own numbers. “If you add up all those costs, you get to $1.59 per mile or more, pretty quickly. Whatever that number is for you — and yours may be higher, especially if you have additional employees, an office, a yard or other indirect costs — that’s your break-even number. You need to average $1.59 — or whatever your break-even number is — for all miles, just to keep from losing money. “In other words, when you take those buck-a-mile backhauls, you need to make at least $2.18 per mile on the head haul. Why? The average of $2.18 + $1.00 is $1.59. Remember, this does not leave you any profit, but it covers the bills. “You could park your truck instead, and you’d save on fuel, driver pay, and some portion of the maintenance and tires, but you’d still have to make that lease payment. That’s an indirect cost. You pay it every month, whether your truck moves or not. Get Paid More.Plan your roundtrips, and know what rates to expect. Look for a TriHaul route through Pittsburgh (see below) — or specialize in a desirable cargo type, or agree to take low-priced loads only when they go into a “Hot Market” where outbound rates are high.